Wilfried Bony played in two African Cup of Nations qualifiers for the Ivory Coast against Congo. Swansea City boss Garry Monk says the extra day of rest could work in their favour after the international break. 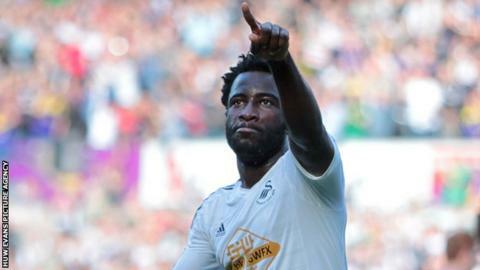 Ivorian striker Wilfried Bony was among the Swansea players on international duty and only returned to Wales on Friday. Monk says he will assess all his international stars before selecting his team to face Stoke City on Sunday. "I check on freshness and how they're feeling mentally and physically," he said. "I'll make that decision, but obviously we've got that extra day. Hopefully it will benefit us." Bony, Swansea's top scorer last season, featured for the Ivory Coast in Wednesday's African Cup of Nations qualifying defeat against Congo. Federico Fernandez of Argentina, Iceland's Gylfi Sigurdsson and South Korean midfielder Ki Sung-Yueng were also among the Swansea players representing their countries during the last week. Monk's side resume their Premier League fifth in the table and level on points with Manchester United after an excellent start to the season. But the Swans are winless in their last four league matches and on Sunday face a side they have never beaten in the Premier League at Britannia Stadium. Swansea drew 1-1 at Stoke in the league in February in what was Monk's second game in temporary charge after taking over from Michael Laudrup. "Stoke is never an easy place to go and we know we have never won there in the Premier League," Monk added. "However, we should have won the last time we played there in February, so hopefully we can repeat that performance and get the victory. "They try and play football, but they still have that direct aspect of their game, which makes them dangerous. "It's very hard to play against them, but we have to go up there with the belief that we have, take it into this game and try and impose ourselves on them. "We can't wait and sit back and hope we can control them - we have to impose ourselves on them."